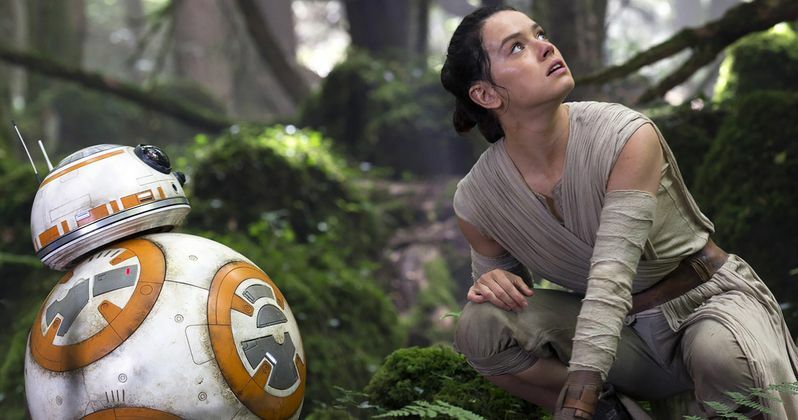 There is certainly no doubt that Star Wars: The Force Awakens is a massive hit, with expectations even higher for its follow-up, Star Wars: Episode VIII, arriving in May 2017. As beloved as the movie is, there are still several unanswered questions fans are pondering, as we begin the long wait for the next installment in this trilogy. The official screenplay, written by director J.J. Abrams, Lawrence Kasdan and Michael Arndt, was recently uploaded to Disney's "For Your Consideration" website for awards season voting, and /Film obtained a copy through unidentified sources. This script offers plenty of details that shed new light on the ending and much more, so if you haven't seen Star Wars: The Force Awakens yet, there will be MASSIVE SPOILERS below. In the three-year build-up to Star Wars: The Force Awakens, we never once saw one of the franchise's iconic characters, Luke Skywalker, in any of the footage, photos or posters before the movie's release. We didn't see the beloved Jedi on the big screen until the very last moments of this blockbuster, when Rey (Daisy Ridley) journeyed to a mysterious island to return his lightsaber. No words are spoken between Rey and Luke in these final moments, leading many to speculate that Rey is actually Luke's daughter. According to this report, the script doesn't specifically say that Rey is Luke's daughter, but it says Luke, "doesn't need to ask her who she is, or what she is doing here," and "his look says it all." This could imply that Rey is Luke's daughter, but it could also mean that he has felt her presence, since she is clearly strong with The Force. After Rey extends the lightsaber to Luke, the script describes this as, "An offer. A plea. The galaxy's only hope." The script ends with, "HOLD ON LUKE SKYWALKER'S INCREDIBLE FACE, amazed and conflicted at what he sees, as our MUSIC BUILDS, the promise of an adventure, just beginning..." The script also sheds some light on Luke's place of exile as well. The script names the planet "AHCH-TO," described as having a, "pristine and mighty OCEAN" with "endless BLUE, dotted with random, beautiful, mountainous BLACK ROCK ISLANDS, dotted with countless GREEN TREES." The planet AHCH-TO is not part of the existing Star Wars canon, or the expanded universe, but the /Film reveals that the word "Ahch" is Hebrew, which translates to "brother." Could this be a subtle Easter Egg which hints that Luke is actually Rey's brother? The site also speculates that the planet's name could also represent "Act 2," hinting that more of this mysterious place will be revealed in the sequel, Star Wars: Episode VIII. This official script also confirms the actual images that Rey saw during her vision, when she first touched Luke's lightsaber. The first image, as many have speculated, is from Cloud City, specifically, "a hallway of from deep inside Cloud City," and the scene where Luke's metal hand touches R2-D2 is described as "a burning temple at night." Many have speculated that this scene could have taken place after Kylo Ren (Adam Driver) turned on Luke and slaughtered his Jedi trainees. Another image of a man being stabbed with a lightsaber only identifies him as a "warrior" stabbed by a "fiery lightsaber," but we don't know who exactly this person is. Finally, this portion of the script confirms that the warriors standing around Kylo Ren in the dark are in fact the Knights of Ren. Perhaps one of the most intriguing details in the script is that, during the scene when we see Rey being left on Jakku next to an unidentified character, that person is none other than Unkar Plutt (Simon Pegg). The script describes Unkar Plutt's "meaty hand" holding her thin arms as she watches the starship fly away from Jakku. When she yells, "No, come back," he tells her "Quiet, girl." We see Unkar early on in the film as the junk dealer that Rey trades with, and we know that he also came into possession of the Millennium Falcon as well. The site speculates that perhaps Unkar was given the Falcon in exchange for watching over Rey as she grew up, but that doesn't appear to be the case. The script also offers some intriguing details about the heart-wrenching scene when Kylo Ren kills his father, Han Solo. The script states that Kylo is "weakened" and "horrified" by the murder, and his "shock" is only broken when Chewbacca screams. In the official novelization of the movie, Snoke tells Kylo that Darth Vader's only weakness was his love for his son, and if not for that, the Dark Side would have prevailed. With that being said, it's quite ironic that killing his father made Kylo Ren weaker. During Rey's confrontation with Ren on the Starkiller Base, the script reveals that Ren becomes a "fearful man" when Rey is striking him repeatedly with her lightsaber, while adding an interesting detail. The script states that "she could kill him right now with ONE VICIOUS STRIKE," but it is then that the chasm is formed in the planet, separating her from Ren. The novelization adds that Rey actually hears a voice saying "Kill him," which the audiobook seemingly reveals to be the voice of Supreme Leader Snoke. What do you think about all of these intriguing new details?